There are certain safety and security systems that are commonly installed to protect commercial buildings, assets, and people. Emergency situations can arise at any time, so it’s important that there are critical systems in place to deal with them effectively. Whether you own a commercial building or rent space and are responsible for installing them yourself, these systems must have a reliable source of power at all times. This is why they are installed directly into the electrical system by a licensed commercial electrician. At Electrical Connection, our commercial electricians design and install emergency safety and security systems as well as the electrical systems to support them. It’s not uncommon to upgrade the electrical panel and install additional wiring, dedicated circuits, and commercial backup generators to power these systems. As a commercial building owner, you can choose from a wide range of products and devices which improve the safety and security of the building and your business. While some systems are required, some are not but are still necessary or beneficial for some types of businesses. Here are 5 commercial safety and security systems you’ll want to consider. Whether it’s fire alarms, smoke alarms, CO2 detectors, CO alarms, or combo units, there are certain safety code compliance regulations that stipulate how many, what type, and where they are to be installed in a commercial building. A commercial building which does not comply with the regulations will have to be fitted with the detectors and alarms. Not every brand new, recently constructed, or renovated commercial building us “up to code”. You cannot assume that the property complies with the building code standards, environmental standards, and ADA access requirements. It can be really confusing to know what to do to bring your building up to code. And it’s equally a problem to know whether or not it currently is. This is because there are many regulations involved and every commercial building is different, so there are different requirements involved. This is where your commercial electrician will be invaluable because they know the local, national, county, and city electrical safety code requirements. Just as we do, they should be able to provide you with an expert electrical inspection to determine what is necessary to meet these minimum requirements. Note that these are minimum standards, which means you have the freedom to install anything additional that you want and need. At a minimum, you’ll want to install some type of commercial security system to deter and help prevent crime. Even a commercial building which sits empty will be vulnerable to break-ins, materials theft, and property destruction. Securing the doors and windows of the building with an alarm system is important. Your electrician can hard-wire a security system into the electrical system. You don’t want to depend on wireless or residential security systems as they are unreliable for a commercial building and easier to bypass. What happens if the lighting in your building goes out for some reason? Whether due to a power outage or an electrical system malfunction, everyone in the building will be trapped in the dark inside a network of hallways and rooms. Emergency lighting should be installed for such situations. The lighting is backed up by a battery power source which connects to the lighting or is already a part of the light fixture. Your electrician can go over the different options available. Video surveillance and monitoring systems are important for a commercial business. This is one system that commercial renters and owners alike can benefit from. These security devices are finding their way into homes so the owner can be alerted by their smart phone and view the home’s video feed whenever a motion sensor activates. Whether it’s a simple system or complicated, it’s a good idea to install a CCTV/Video Surveillance camera and a monitoring station. 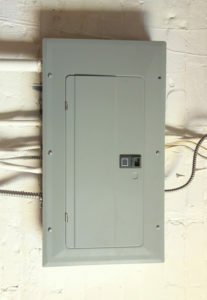 A commercial surge protection system can be installed for the entire building. This equipment will protect all your appliances, electronics, computer systems, wiring, lighting, and everything else using power in the building. The unit is installed into your electrical panel/breaker box by your commercial electrician.